After decades of mutual suspicions, the U.S. and Iranian governments appear headed toward face-to-face contacts. But mutual trust still awaits truth-telling about important facts that defined the relationship — and that may require breaking a dangerous addiction to secrecy. If President Barack Obama is right about the revived hopes for settling several interlocking crises in the Middle East — from Iran’s nuclear program to the Israel-Palestinian conflict – a good starting place would be a decision by the various sides to lift the curtains of unnecessary secrecy surrounding both current events and their historical context. But the key actors in these geopolitical dramas can’t seem to shake their addiction to secrecy. For instance, on the historical front, Iran and Russia – as well as Israel and the U.S. intelligence community – have evidence about alleged Republican-Iranian interference in President Jimmy Carter’s hostage negotiations with Iran in 1980, but this material is still kept hidden. Over the years, key Iranians, including former President Abolhassan Bani-Sadr, have declared that a secret deal was struck with Ronald Reagan’s presidential campaign to delay the release of 52 American hostages in Iran until after the U.S. election to guarantee Carter’s defeat. But the Iranian government has kept officially mum on its role in the so-called October Surprise case. In 1993, the Russian government supplied a U.S. congressional task force with a secret summary of Soviet-era intelligence information corroborating the allegations of a Republican-Iranian deal, but the summary contained few details about Moscow’s proof and there was no serious U.S. follow-up of the disclosure with Russian officials. Israel allegedly helped implement the brokered deal by becoming Iran’s weapons supplier in the early 1980s. The U.S. intelligence community presumably has October Surprise information, too, although when the congressional task force sought it in 1992 the CIA director was Robert Gates, one of the CIA officers implicated in the 1980 operation. He had been installed at the head of the intelligence community in 1991 by President George H.W. Bush, another suspect. So, it probably should have come as no surprise that Gates, the CIA and Bush’s White House dragged their feet on document production in 1992. So, as a show of good faith now, the various players could stop playing games and open up their archives to finally resolve this nagging historical mystery. Some Republicans might even think better of the Iranians if they knew that Ayatollah Ruhollah Khomeini helped install their hero, Ronald Reagan, in the White House. Other Americans might see it as a case of geopolitical karma: the United States secretly undermined Iran’s democracy in 1953 and the Iranians returned the favor to the United States in 1980. Just recently, the U.S. government confirmed that the CIA, indeed, had organized a coup d’etat against the elected Iranian government of Prime Minister Mohammad Mossadegh in 1953, installing the autocratic Shah of Iran who governed Iran harshly until 1979. On a more current topic – the question of who was behind the chemical weapons deaths outside Damascus, Syria, on Aug. 21 – government claims of secrecy also should be dropped and all pertinent evidence should be presented to the world. The Russians have a 100-page report purportedly clearing the Syrian government but they haven’t made it public. The Obama administration claims to have physical evidence proving the Syrian government’s guilt but won’t release it, either. Instead, President Obama and Secretary of State John Kerry seem committed to a strategy of simply de-legitimizing any doubts that Syrian President Bashar al-Assad is guilty. On Aug. 30, the Obama administration released a four-page “Government Assessment” that asserted the Syrian government’s guilt without presenting any evidence at all. The white paper was palmed off as an “assessment” from the U.S. intelligence community but it really was posted on the Internet by the White House press office. In a pattern reminiscent of George W. Bush’s phony case for war with Iraq in 2002-2003, U.S. journalists and politicians quickly recognized that their career prospects were brightened if they joined the anti-Assad stampede and darkened if they got in the way. Then, the 38-page report issued by United Nations inspectors last week presumably sealed the deal on Assad’s guilt, as major U.S. news outlets extrapolated from evidence in the report to conclude that the attack must have been launched by Syrian government forces intimately connected to protecting Assad. 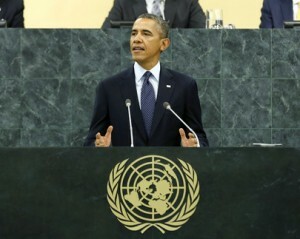 Though the actual facts in the UN report were much murkier – including the absence of any chemical weapons agents at one site and inspectors’ warnings that the evidence at the second site may have been manipulated – the U.S. news media brushed past those concerns and marched in lockstep with Secretary Kerry and President Obama. Everyone, it seemed, knew that only Assad apologists and crazies would continue harboring doubts. Secretary Kerry declared as much when he announced that he would not let the UN get bogged down in a debate over the guilt of the Syrian government. “We really don’t have time today to pretend that anyone can have their own set of facts,” he said in a slap at the Russians. And, Robert Fisk, a veteran reporter for London’s Independent newspaper, found a lack of consensus among UN officials and other international observers in Damascus – despite the career risks that they faced by deviating from the conventional wisdom regarding Assad’s guilt. “In a country – indeed a world – where propaganda is more influential than truth, discovering the origin of the chemicals that suffocated so many Syrians a month ago is an investigation fraught with journalistic perils,” Fisk wrote. “Nevertheless, it also has to be said that grave doubts are being expressed by the UN and other international organisations in Damascus that the sarin gas missiles were fired by Assad’s army. “While these international employees cannot be identified, some of them were in Damascus on 21 August and asked a series of questions to which no one has yet supplied an answer. Why, for example, would Syria wait until the UN inspectors were ensconced in Damascus on 18 August before using sarin gas little more than two days later – and only four miles from the hotel in which the UN had just checked in? “Having thus presented the UN with evidence of the use of sarin – which the inspectors quickly acquired at the scene – the Assad regime, if guilty, would surely have realised that a military attack would be staged by Western nations. “As it is, Syria is now due to lose its entire strategic long-term chemical defences against a nuclear-armed Israel – because, if Western leaders are to be believed, it wanted to fire just seven missiles almost a half century old at a rebel suburb in which only 300 of the 1,400 victims (if the rebels themselves are to be believed) were fighters. Fisk also reported that “information is now circulating in the city [of Damascus] that Russia’s new ‘evidence’ about the attack includes the dates of export of the specific rockets used and – more importantly – the countries to which they were originally sold. They were apparently manufactured in the Soviet Union in 1967 and sold by Moscow to three Arab countries, Yemen, Egypt and Colonel Muammar Gaddafi’s Libya. “These details cannot be verified in documents, and Vladimir Putin has not revealed the reasons why he told Barack Obama that he knows Assad’s army did not fire the sarin missiles; but if the information is correct – and it is believed to have come from Moscow – Russia did not sell this particular batch of chemical munitions to Syria. So, rather than bullying people who still have questions about the Aug. 21 incident – or just shouting more loudly than the other side – the Obama administration and the Russian government might want to lay their cards on the table. The secrecy addiction among major world powers is deeply corrosive to democracy and makes a mockery of popular rule. If President Obama’s pleasant words about the universal human right of self-governance are to mean anything meaningful, he should accept that democracy is meaningless if a population is denied facts and left drowning in a swamp of propaganda.